Nexus 6 and Project Pitchfork! 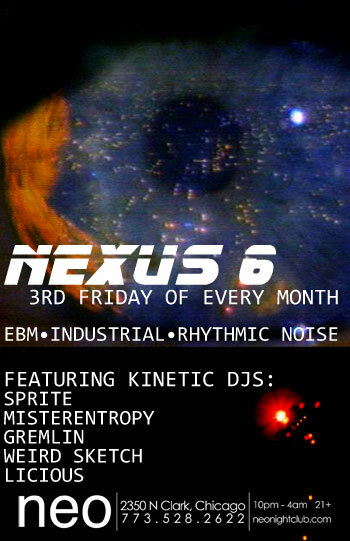 Tonight is our monthly Nexus 6 at Neo! This time around, DJs Licious & MisterEntropy will serve up the beats, making you move to the best new industrial, ebm, rhythmic noise, and leaving room for plenty of classic cuts as well. Free before 11 PM. Don’t miss it! Saturday night is the Project Pitchfork and Ayria show at the Abbey, also featuring Kinetic’s own DJ Sprite doing sets before and in between the bands. Doors 9PM. Tickets $17 in advance available via http://www.demonsanddarlings.com ($20 at door). ~ by infomorph on June 18, 2010.